WOW! beatiful and badass, nice art work. This woman looks far more intimidating than most of the death/ dark knight designs I have ever seen. Her eyes mean real business. WoW. 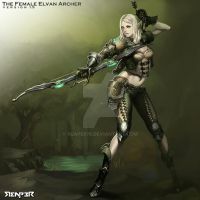 And it's truly rare to see such a badass female warrior who still keeps a certain level of sexiness. this better than the one I already have in my favourites! the look in her eyes! chilling! I love her stern, icy expression. This is awesome! Very nice work. Great! Fantastic! I love it! Damn fine, no other words for it. Holy S**T, This is awesome. Very reminiscent to castlevania S.O.T.N. So badass, love the bold colors and contrast. increible, el detalla las luces y sombras y los coores probocan un ambiente espectacular al arte final no tienes algun tutoriañ de pintura digital para poder practicar aquel metodo de pintura de ante mano gracias. incredible, the highlight and shadow detail, and coordinate a spectacular environment to trigger these failures artwork you do not have any digital painting tutorial to practice this method to paint by hand. Hi ...Dear ... reaper78 ...!!! HAPPY NEW YEAR MY BEST WISHES FOR 2011...!!! This is exactly why I watch this group. wow fantastic but how do yu come up with ideas for this type of stuff?? The jealousy pours from me in a seething wave of green fury even before my browser completely renders the image. Excellent Drawing! You should try making a demon knight or werewolf. I think that would be awsome.